MARIA ANGELICA VISO Caracas, march 24 of 1971. Studies: 2017-2018 Diploma in Venezuelan Visual Arts. Center for Latin American Studies Arturo Uslar Pietri, Metropolitana University, Caracas, Venezuela. 2017-2018 Diploma in Western Art History. Center for Latin American Studies Arturo Uslar Pietri, Metropolitan University, Caracas, Venezuela. 2015 Creative Thinking Course: Strategies to Develop and Refine your Projects Ideas. Node Center Berlin, Germany. 2014 MOMA Course (Museum of Modern Art NY) Modern and Contemporary Art: 1945-1989. 2014 ChromaPremier Pro Course, Axalta Coating Systems Venezuela C.A. 2010 Course of advanced carpentry and finishes in polymeric lacquers such as polyurethane, nitrocellulose and acrylics, with Architect Gustavo González Lesghi in Carpintería Quadros, Caracas, Venezuela. 2008 Sculpture course with Architect Ralph Anthony Brewer, Caracas, Venezuela. 1988-1983 Degree in Business Administration, Metropolitana University, Caracas, Venezuela. 1978-1993 Theoretical-practical studies under the direction of the artist Ofelia de León developing specialization in the techniques of charcoal, pastel, acrylic and oil, Caracas, Venezuela. Awards: 2015 Arts Advocacy Award granted by TheWIFTS, Los Angeles, California, USA. 1983 Third place in national art competition at the Art Salon of Maraven, Caracas, with "The Patio in Seville" (technique: oil on canvas). 1982 First place in art contest of the Playa Azul Club, Naiguatá with "Casa Colonial Estado Zulia" (technique: oil on canvas). Individual expositions: 2015 "Insertions", Parenthesis Gallery, Los Galpones de los Chorros Art Center, Caracas, Venezuela. 2014 "Deshojando" Parenthesis Gallery, Los Galpones de los Chorros Art Center, Caracas, Venezuela. Collective exhibitions: 2018 Exhibition "Pixels". Imago Art in Action, Coral Gables, Miami, United States. Exhibition "Only Women". Venezuelan Association of Plastic Artists, AVAP, Caracas, Venezuela. 2017 Auction House Ronald Mc Donald, Lebanon Club, Caracas, Venezuela. Exhibition "Venezuelan Art". Venezuelan Association of Plastic Artists, AVAP, Caracas, Venezuela. 2016 Summer Collective, Art Nouveau Gallery, Miami, United States. "In Three and Two". Parenthesis Gallery, Los Galpones de los Chorros Art Center, Caracas, Venezuela. "Pixels" GBG arts Gallery, Caracas, Venezuela. 2015 "Collective Encounter", Parenthesis Gallery, Los Galpones de los Chorros Art Center, Caracas, Venezuela. XI Fundana Auction "Illusions", Banesco Headquarters, Caracas, Venezuela. "Art Exhibition of the Americas", Art Plus Gallery, Toronto, Canada. 2014 Exhibition "Crossing Boundaries". Art Fusion Galleries Miami, United States. 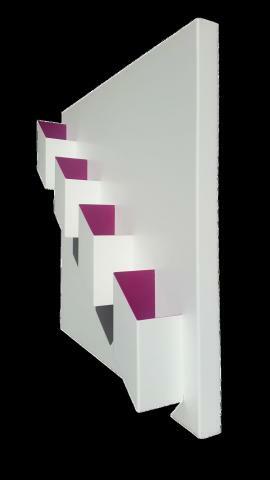 Exhibition Structure, Form and Color with artist Rachel Alvarez Villasmil. Art3 Gallery Caracas, Venezuela. 26ª Iberoamerican Art Fair, FIA 2014. Tamanaco Hotel, Caracas, Venezuela. X Fundana Auction, "The Reflexion", Banesco Headquarters, Caracas, Venezuela. Exhibition "Latin American Art Exhibition 2014". 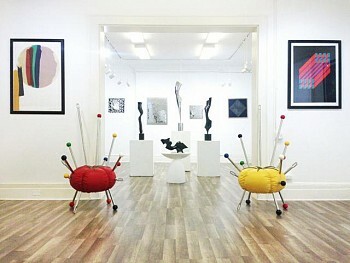 Art Plus Gallery, Ottawa, Canada. Exhibition "Art of the Americas". Art Plus Gallery, Toronto, Canada. 2013 "Fusion X- Art Ascension" Art Fusion Galleries Miami, United States. V Biennial of Sculpture . Trazos Gallery, Lido Center, Caracas, Venezuela. Collective exhibition Art Bazar. Art3 Gallery Caracas, Venezuela. Auction: The Art is Auction for a Smile, Second Edition Caracas, Venezuela.